7.1%, We dialed it in with some of our favorite hops. Grapefruit, resin, dankness and a touch of tropical fruits. Heaven, Hell or Hoboken walks a fine line between an IPA and Double IPA. Coming in at 68 IBUs and 6.5% ABV, the Nugget hops really come through on the back end. Cascade hops were added late in the boil and impart a flowery, slightly citrus smell. The dark, amber color and slight sweetness can be attributed to the 120L specialty grains that we use. Well balanced, hop heavy, and pretty delicious. We hope you have much fun drinking it as we did making it! The pale ale is a lighter, refreshing, full bodied session beer. Session beer: one who retains the flavorful taste of a craft beer, but allows you to enjoy a few without seeing double. It is a light copper color, has a crisp, flavorful taste. A lager brewed with real raspberries added after filtration. The berries add a fruity aroma, tartly sweet taste and a subtle purple color and haze. You may see fruit pulp in the beer. Delicately balances full flavor with a crisp, refreshing taste and subtle hints of spice. Naturally cloudy, bottled with yeast. San Francisco's famous Anchor Steam®, the classic of American brewing tradition since 1896, is virtually handmade, with an exceptional respect for the ancient art of brewing. The deep amber color, thick creamy head, and rich flavor all testify to traditional brewing methods. Toasted Lager’s balanced flavor of malt and hops makes for easy drinking and the special lager yeast produces an exceptional, long-lasting smooth finish. An ale that has all the chocolate and roasted nut flavor of a classic Porter, with an enigmatic surprise thrown in for good measure, real vanilla bean. A vanilla kiss in a rich, dark sea. Inspired by the original East India Pale Ales brewed in England in the early 1800’s for the troops in India. Brooklyn Lager, the Brewery's flagship label, is New York's "hometown" beer, brewed to a pre-Prohibition recipe that dates back to the days when Brooklyn was the brewing capital of the East Coast. 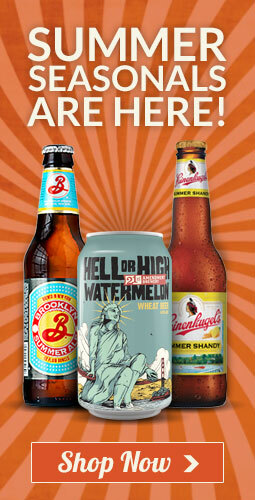 Brooklyn Lager has won numerous awards. Wrote Michael Jackson in the Simon & Schuster Pocket Guide to Beer: "The dry-hopped, fresh, flowery, firm, flavourful, Brooklyn Lager **-*** started well, in 1988, and has gained in character since." Brooklyn Brewery Variety Pack includes the pre-Prohibition Lager, Pennant Ale, Brown Ale, East India Pale Ale and Pilsner. Mermaids, those mysterious aquatic lovelies, have popped up all over the world in legend since 1000 BC. No scientific evidence has ever surfaced to support their existence, but we’re not ones to argue with folklore. Too extreme to be called beer? Brewed to a colossal 45°P, boiled for a full 2 hours while being continually hopped with high alpha American hops, dry-hopped every day in the fermenter for a month, and aged for a month on whole leaf hops, 120 Minute IPA is by far the strongest IPA ever brewed. And at 21% ABV and 120 IBU’s, you can see why we are calling this the Holy Grail for Hopheads. Editors note: ABV reduced down to 18% in 2009. A generously hopped ale with a deep red color and pours with a nice frothy head. The abundance of hops will conjure some provocative aromas with hints of raisins and citrus. This turbo charged version of the Road Dog porter is mysteriously dark with a rich malty body, intense roasted flavors, and a surprisingly unique hop kick. You might notice that the label is missing a key, iconic element. You know, starts with “M” ends with “ountie.” It’s true – we did make the decision to remove the Mountie from CBS packaging out of respect for the Royal Canadian Mounted Police. The first thing you notice is the hazy, cloudy appearance. That’s how you know it’s unfiltered. What hits you next is the spicy aroma of Cascade hops, followed by the crispy, fruity ale flavor delivered in a smooth, creamy body, the result of blending barley malt with torrified wheat. It’s not like any other Goose Island Beer, but no less that you’d expect. More than twenty years ago Greg Hall wanted to brew something truly unique for Goose Island brewpub’s 1000th batch - he just needed inspiration. Then a chance encounter between Greg and Jim Beam’s legendary More than twenty years ago Greg Hall wanted to brew something truly unique for Goose Island brewpub’s 1000th batch - he just needed inspiration. Then a chance encounter between Greg and Jim Beam’s legendary distiller, Booker Noe, led to Goose Island acquiring the barrels for what was to become the world’s first bourbon barrel aged beer. Since then, the beer has become a local favorite and globally known beer - and still people line-up down the street for its Black Friday release in Chicago. We’re super excited about this year’s variants, and we hope you are too! Original Bourbon County Brand StoutAged in 4+ year old Heaven Hill Bourbon barrels, the original bourbon barrel aged stout is as good as when we first made it over 20 years ago. Flavors of cocoa, vanilla, caramel, almond, cherry, plus leather and tobacco flavors permeate this complex beer that deepens with each sip. A hop lover’s dream. This classic ale adds a fruity aroma, set off by a dry malt middle, to ensure that the long hop finish is one you’ll remember. A crisp, refreshing tasting beer with a rich, delicious flavor. Brewed in America in the Guinness tradition known only to our Master Brewers with our famous Guinness yeast and Mosaic and Williamette American hops.